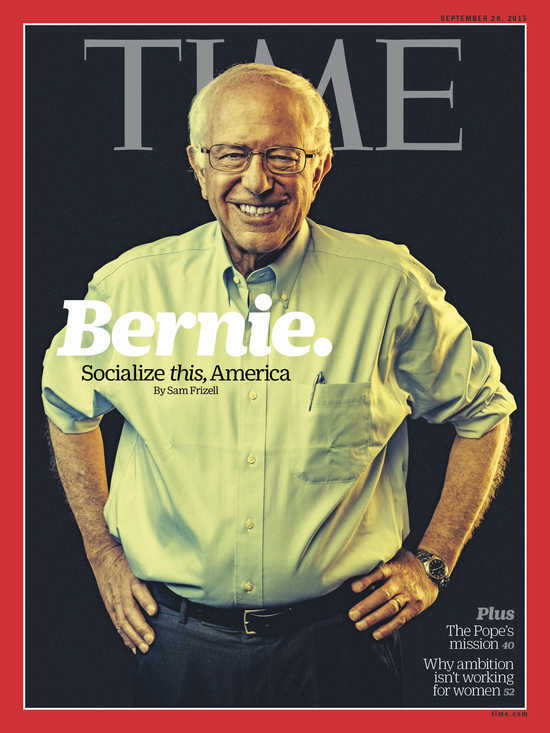 Bernie Sanders “Wins” GOP Debate & Makes Cover Of Time–Will He Get To Debate Hillary Clinton More Than Six Times? Sen. Bernie Sanders (I-Vt.) has won a doubleheader victory this week. His dramatic gains in the presidential campaign have been recognized by TIME magazine placing him on its cover, a major breakthrough in conventional media for Sanders, while his critical commentary about the debate in his Facebook post was by far the single most-read Facebook post of the evening! The decision by TIME to make Sanders its cover story is hugely important. It is a long overdue recognition by a bastion of the old media that Sanders offers an extraordinary populist message that has ignited a powerful populist grassroots movement. Almost all of the mainstream media have been far too slow to recognize the power of the progressive populist movement that Sanders calls a political revolution. This is finally, fortunately, beginning to change and the TIME magazine cover story is exhibit A of the progress Sanders and his supporters have made. On the second front, the ability of Sanders to win the social media front to criticize Republicans and promote his populist agenda combines the medium of the moment with the message that resonates with voters. Several weeks ago, Jenny Q. Ta, a nationally prominent entrepreneur and the founder and CEO of the social media “net-WORTH-ing platform” Sqeeqee.com told me that social media in the 2016 campaign will be as powerful as television was during the Kennedy-Nixon debates in 1960. How right she was! My point today is that Sanders won the GOP debate on two levels. First, don’t miss the story in The Hill by Neetzan Zimmerman, who is spearheading The Hill’s social media initiatives, reporting that Sanders’s critique of the debate on Facebook was far more popular than any other presidential candidate of either party. This triumph by Sanders in the new medium of social media has powerful implications for Sanders winning the battle of ideas of his message against Republicans. Second, Sanders has the advantage of the message conveyed by the media, old and new. Sanders’s core argument is that our economy is unjust, unfair, rigged in favor of the super-wealthy and rigged against poor and middle-class Americans. Being declared the winner of the GOP debate by pundits is hardly the same as having the opportunity to debate, and hopefully beat, Hillary Clinton before a prime time audience. Just imagine Sanders pointing out how he reviewed the same information about the Iraq war as Clinton, and he is the one who clearly got the vote right. Contrast Sanders and Clinton on virtually any other issue. More often than not, it will be Sanders who is in the Democratic mainstream, with Clinton off to the right. The situation has changed considerably since Debbie Wasserman Schultz helped rig the debate schedule for Hillary Clinton, over the protests of Bernie Sanders and Martin O’Malley. At the time it was expected that Clinton would be a strong front runner, and would benefit from limiting publicity for her challengers. Since then the Republicans have received extensive coverage from two debates, while the Democrats can only claim symbolic victories from the media. Clinton has fallen behind Bernie Sanders in New Hampshire, and maintains a diminishing lead in Iowa. At this point it is clearly in the interest of the Democratic Party to receive coverage from debates, and perhaps even Hillary Clinton might decide a debate is in her interest, potentially becoming the underdog in the first two contests. Hillary Rodham Clinton’s rivals in the Democratic primary have been demanding for weeks that the party hold more presidential debates than the scant six that are planned, and on Friday they got a big boost when House Minority Leader Nancy Pelosi of San Francisco said she agrees with them. …The debate schedule has become an increasingly awkward issue for the Clinton campaign as the first scheduled event, on Oct. 13 in Nevada, approaches. Clinton’s primary challengers have suggested the schedule was designed by party insiders to favor the front-runner, who was so far ahead in the polls when it was drafted that there seemed to be little for her to gain in the race by sharing a stage with lesser-known opponents. Clinton’s support in early voting states has slipped considerably since then, particularly in New Hampshire, where some polls show her trailing Sen. Bernie Sanders of Vermont. Now, some longtime Clinton allies are saying it may be in her interest to have more debates. But Pelosi’s comments put more pressure on the DNC to reopen it. The problem with the debate schedule is not only that it limits the candidates to six debates, but that many of the debates appear to be scheduled at times to limit the potential audience. There will only be four before the Iowa and New Hampshire contests, and three of these are on weekends, including December 19, competing with holiday parties. Incidentally, for sticklers who insist upon only considering those actually at the debate in determining the winner, the consensus in the media and the polls is that Carly Fiorina won the debate. It is the outsiders who are generating the excitement in both parties, but of these outsiders (also including Donald Trump and Ben Carson), only Sanders has the right ideas to lead the United States.